All you need for this healthier ranch alternative is a Lipton ranch packet and 16 oz. plain Greek yogurt. 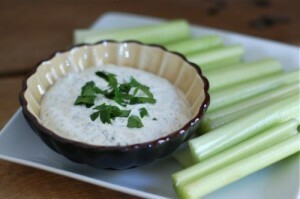 Easy dip for veggies, pita, or topping for burgers and wraps! Combine the yogurt and seasoning in a bowl. Refrigerate for at least one hour to allow the flavors to meld. Garnish with fresh herbs just before serving.